Looks just as pictured (once I ironed it using steam setting). What a great value considering it comes with sheets and two kinds of shams plus accent pillow. Plus the sheets are super soft and comfy. I ordered a king size for my queen bed and was glad I did. Create a luxury Oasis in your master bedroom or guest suite with this Ruffled and Pleated border color block comforter set. Elegant piping detail create a color block theme in pinch pleat details as well as solid background. This set is is reversible to a contemporary scroll like pattern. Also included are embroidered detail on the decorative pillow. Euro Shams with piping details are included are as well. Also included are super soft coordinating microfiber Sheets Set to complete the look. Adore this set. Can’t wait to get pillows for the 4 shams that are included. Soft fabric. Machine washable. Lightweight. I put a queen sized plush blanket between the top sheet and this comforter. Is perfect for this warming weather. Love that it is reversible. We have a dog. So hopefully this will have some mileage on it. 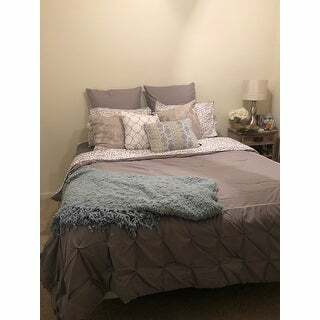 Looks amazing on my bed, goes wonderfully with the neutral colors in my room and I can throw in pillows with pops of color to upgrade the look. The quality is excellent! Good quality. Great design. The bedding comes with 2 king size shams and 2 euro shams. You need to purchase the euro pillows. It’s nice that it’s reversible. Very good value for the price. Nice set but I guess I did not look close enough but the Euro Shams are just covers, not actually pillows so you need two buy to euro sham pillows to put in the covers. I loved it. Perfect for guest room. The comforter is perfect - not too hot or cold. It is soft. The sheets are white not grey. You can add any color to this bedding and will match. Love the colors. Soft texture. Reasonably priced. Lots of shams included. 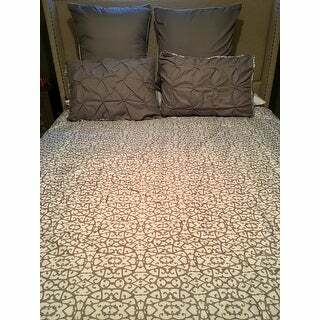 Love this comforter! Washed it when I got it with no issues. Only complaint is I do wake up with night sweats but I am also not great with polyester. So I don’t blame the comforter. Overall beautiful! The sheets are white though. Wish they came in the colors pictured and not white. Lovely Comforter! 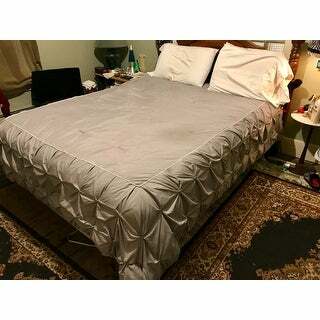 Love the sheets as well! So gorgeous! Love love love it! It it comfortable and all the pieces that come are amazing. It’s the best comforter ever! May buy another comforter for my spare! Very clean look! Makes space look larger and bright. Mid-range thread quality not super luxurious if that's what you're looking for. Very basic but yet very presentable. My son loves it. Very nice and masculine. This is a cool set of bedding. Great quality. "Can this fit for a Cal King?"